Today we took two tours of Chichen Itza, the first guided by Heath, a Mesoamerican archaeologist, the second by Carlos, a local guide who had 30 years of experience. 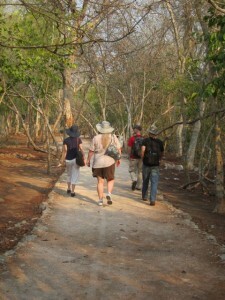 Our idea was to compare and contrast the tours and see how each guide took us through the site and its story. Both tours were excellent, but each presented a different Chichen Itza and offered a different perspective on the ruins, their meaning, and their wider context. 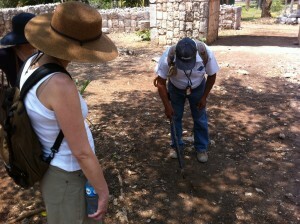 Heath’s tour was one of a professional archaeologist, framed in terms of current research in the field of Mesoamerican archaeology. He began by taking us out of the tourist zone to the Temple of the Initial Series. This monument was inscribed with the only complete Maya date known in Chichen Itza (corresponding to July 13, 878 AD). We learned that its iconography speaks to connections between Chichen Itza and the sites in Central Mexico, especially Tula. Its importance, we learned, is that it demonstrates a link between the earlier Classic Period Maya centers to the south and the iconography found in the north of the site, which shares strong similarities with Tula. From the Temple of the Initial Series, we worked our way back to the site that was open to the public. Here Heath told us of the warriors/divine kings who led the ancient inhabitants of Chichen Itza and held onto power through elaborate rituals and long-term rivalries with their neighbors. As we looked at the remains, we heard a rich, expert narrative about cultural syncretism, the iconography of kingship, its role in the creation of power, and the changing geopolitical panorama of the Mayan past. Then it was Carlos’ turn. We told Carlos the parts of the site that Heath had not covered, which, by chance, included some of its more sinister and sensational remains: the Temple of the Warriors (with a relief carving of eagles and jaguars devouring human hearts), the huge ball court where the Maya played a ritual game that ended in human sacrifice, the sacred cenote, or sinkhole, where the Maya sacrificed human beings and precious objects to the rain god Chaac. Carlos moved at a slower pace, painting a graphic picture of a culture that practiced human sacrifice in order to appease the gods and control the elements. He was much more of a storyteller than Heath. And there was much more blood. 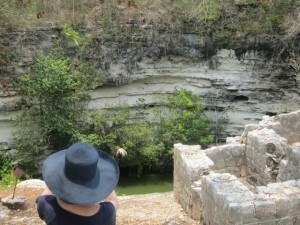 But what interested me most was that way that he interwove his story of the Maya with stories of his own life. The ancient Maya, he said, were his ancestors (his mother was fully Mayan and his father partially so) and, as he told us about the ruins, he also spoke of his own family and their past and present ways of doing things. It was also clear that Carlos knew the site in a different way than Heath did and had a very different relationship to it. He knew the history of the remains, but he also knew the guides, the people who sold tourist souvenirs, and their children. This was the place that he had worked for many years. He knew the state of the site today and how it had changed over time — how the numbers of visitors had increased dramatically since the 90s and would do so again in 2012 when the ancient Maya predicted the end of the fourth age. What should we take from this? 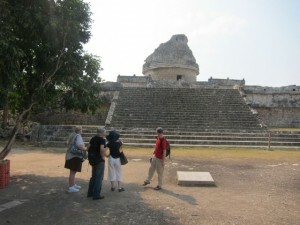 The many different types of knowledge about the Maya that we have encountered during our travels fascinate me. Our two tours offer an example. Heath, a professional archaeologist trained in an American university and Carlos, a professional tour guide at Chichen Itza, both have stories to tell about the ancient stones and a stake in their interpretation; both play a role in the making of the Maya.